In this post, we will quickly cover how Jamahook can help you to make money on the internet as a music producer and how you can create great music production in less time, using our sound matching technology. Jamahook matches your sounds with a huge database of other sounds. We help you to sell your music online: Music producers that want to purchase sounds for their productions will find your sounds more easily. And if you are looking for an extraordinary loop for your production, we will help you to find the best ones out there. No more scrolling through thousands of loops and samples that are irrelevant. We match music that works together. Jamahook helps you to make money online with your music productions. Any part of your music productions (tunes, beats, loops, vocal lines, instrumental lines) can be used in remixes or new productions of other music producers. Sell your finished beats or unfinished productions or loops. On our portal it can be found by others to complete their productions simply through our matching algorithm. How much does Jamahook cost me? Uploading and offering your tunes is completely free! Once you sell a tune over Jamahook, we will take a small commission from your sales transcation. You can find all your sales in the “Sales History” section under the menu item “Transactions” on Jamahook. Make money with the content and sound you offer. Simply register on jamahook and then, on your profile connect to stripe to creat a stripe account. Then upload your sounds on the marketplace and let our algorithm do the rest. You can also promote your content on Jamahook through sharing on Facebook or Twitter. 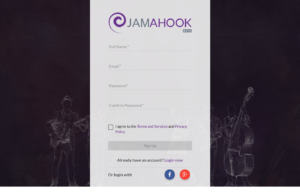 It takes only 30 seconds to create your profile on Jamahook (and it’s free). Create your account today and start making money with your music production.